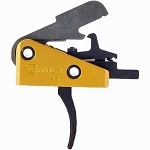 For the discriminating shooter, demanding the utmost performance from their trigger, Timney has created a new line of triggers designed to be robust and yet delicate enough to be set with a pull weight as low as 8 ounces. An engineering accomplishment, the Calvin Elite series of Timney Triggers feature wear components that are made from A2 tool steel, heat-treated to Rockwell 58 and Teflon-nickel coatings. Sears are wire EDM cut and triggers are CNC machine using state-of-the-art robotics. The lightweight 6061-T6 aluminum housings are CNC machined and anodized Timney Elite Gold. 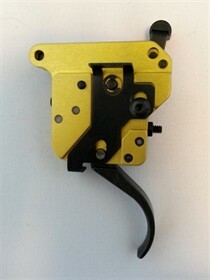 The Calvin Elite Series of triggers are named for Calvin Motley, Timney s design genius, who is responsible for such award-winning triggers as the Timney AR drop-in trigger, Remington 700 with unique trigger blocking safety and loads of other critically acclaimed replacement triggers. Lightweight 6061-T6 CNC Machined aluminum housing with Wire EDM cut, Heat treated Tool steel trigger and sears. Featuring a double sear design. Timney Golden Elite colored housing. Two position, trigger blocking side safety. Fully adjustable Sear Engagement, Over-travel, and pull weight from 8oz.-2.5lbs. 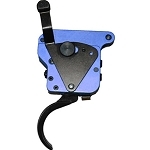 Available in blue(black) and Nickel Plated.